Every four years, the summer Olympics return to bring us endless gymnastics, horseback riding, archery, and more. And people who are dissatisfied with the usual Olympic coverage — and especially with the sexism that often goes along with it — might want to try getting at least some of their Olympic news from podcasts this time around. Because there really is a podcast for everything these days. There are, obviously, lots of sports-themed podcasts out there, some of which focus on specific sports and some that focus on sports in general. They aren't all headed to Rio, or even making episodes about the summer games, but a decent number of them are. And best of all, they're convenient. Instead of trying to find time during your day to watch an event or read up on the way things are going, you can just devote some of your usual podcast-listening time to the Games. It's a win-win for everyone. NBC has long been the go-to destination for all things Olympics, so it only makes sense to turn to their sports podcasts now that the Olympics are in full swing. Although there isn't a podcast dedicated solely to coverage of the Games, several of NBC's existing sports podcast channels have already done pieces on the Olympics. More are likely to follow as things get underway, too, so stay tuned — especially to the Poscast, which you can find here. Created by USA TODAY, For the Win covers all manner of sports and sports-related issues. They've already started their Olympics coverage, talking about both the events and Rio itself, with more expected to follow. Check out their offerings here. All the events in the Olympics are awesome, but gymnastics has always been a cut above. So if that's what you're most interested in, why not check out a podcast that's devoted exclusively to that? Gymcastic is definitely the podcast for you, because why not just skip right to what you really want to hear? You can find their podcast episodes here. Sports Illustrated isn't just about their swimsuit issue — during the Olympics, they're releasing daily podcast episodes through their new podcast Very Olympic Today. Every night, the hosts will discuss the day's big events and what's coming up the next day. So if you want to keep up and stay informed about all the important things during the Games, this is the podcast for you. Check them out here. The Olympics are not just their present — they also have a long and glorious history, and what better time to review that than when new history is being made? So to appreciate the great Games of yesteryear and make this year's events that much sweeter, check out the Olympic Legends podcast here. The Olympics are not just about gold medals and inspiring athletes; they're also about international camaraderie and the world coming together in the spirit of friendly competition. So in that flavor, why not check out some podcasts from outside the United States? After all, with the Internet, such things are easy. One easy leap to make? Just hop over our northern border and listen to the delightfully named Bring Your Eh Game podcast from Yahoo! Sports, which will be covering the games. Find episodes here. If you're not as interested in the Olympic events themselves so much as everything else that comes with putting on an event of this scale, the Slate podcast Hang Up And Listen might be for you. The sports podcast covers all sorts of sports-related issues, and has already started looking at the Olympics — but be warned that some of their episodes are only for Slate Plus members. Still, you can find the publicly available ones here. 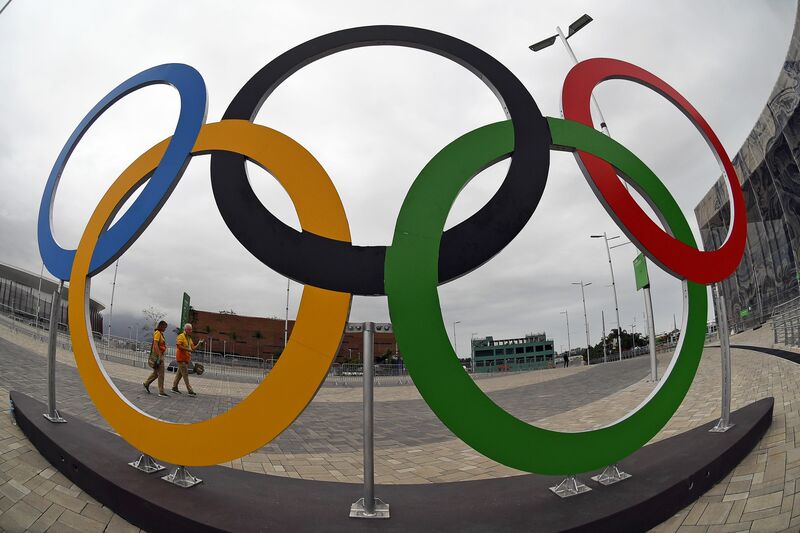 David Zirin who runs the sports section at The Nation, is headed to Rio for live coverage of the Olympic Games, so you can expect awesome things from his podcast, Edge of Sports. If you're looking for some on-the-ground coverage that address both the games themselves and the social issues surrounding them, David Zirin is for you. You can find full episodes of Edge of Sports here.